One of the most luxurious vessels in the Galapagos, the MV Origin Galapagos Cruise combines tasteful modern design, luxury service and environmental sustainability. 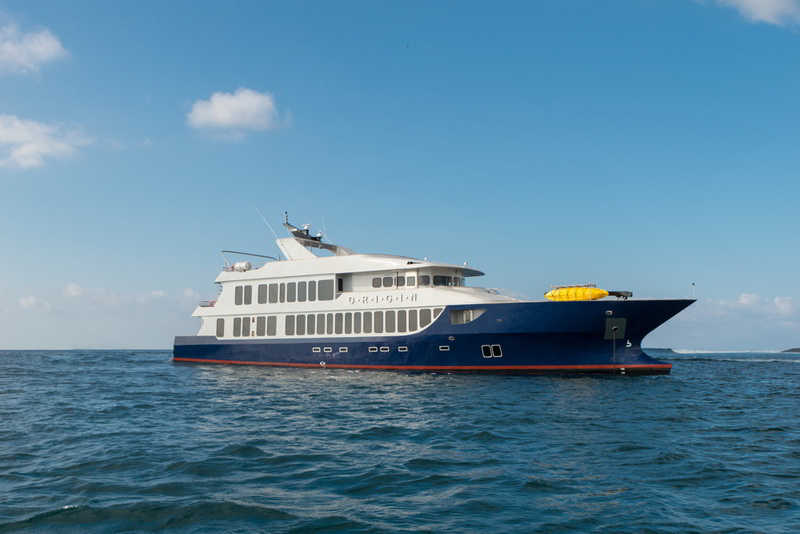 With ten spacious staterooms and top-notch cuisine, the Origin offers a first-class luxury cruise experience in the Galapagos for discerning travelers. 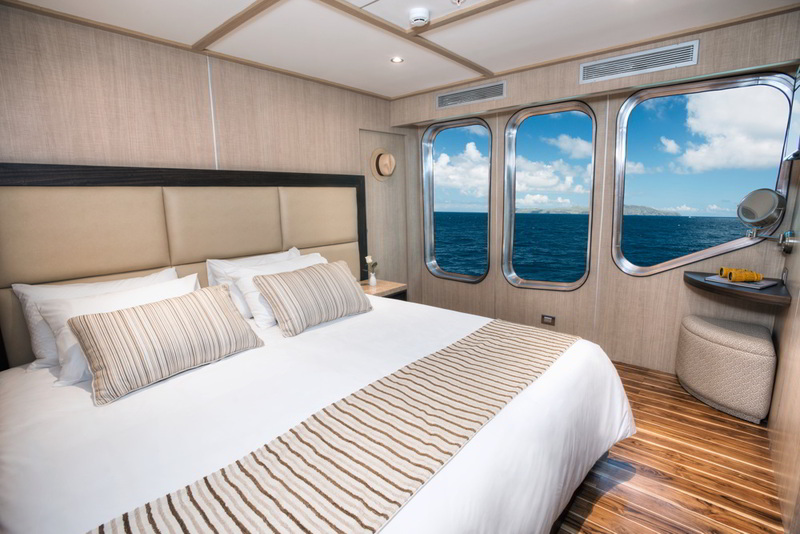 There are ten inviting deluxe staterooms with large windows, connecting you with the incredible landscapes of the islands. 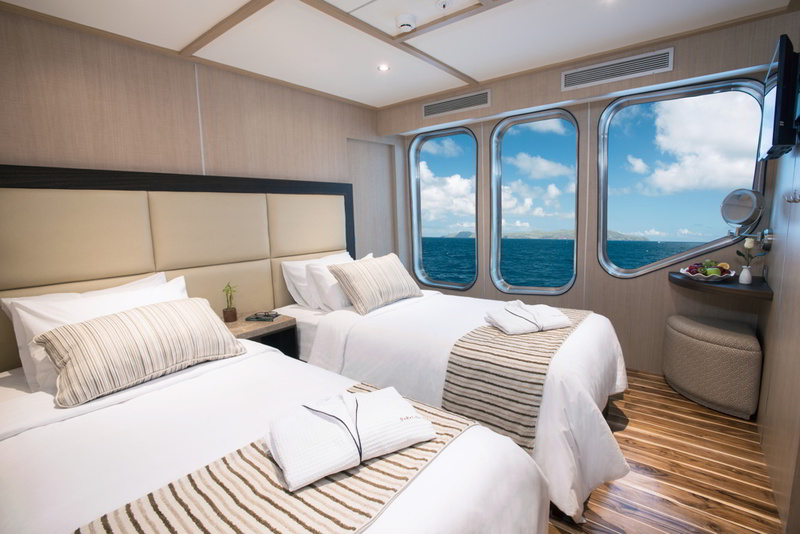 All the roomy cabins are on the main (Beagle) deck and can be configured as twin rooms or double rooms with a King bed. Two cabins have interconnecting doors and two cabins can accommodate triples. 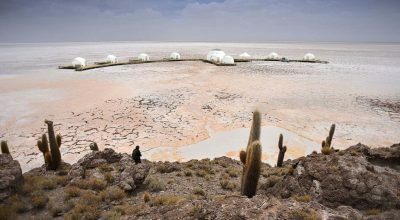 Each cabin has a private en-suite modern bathroom with a rainfall shower and ocean views. Fine bed linens, climate controls, memory foam and soft pillows ensure a good night’s sleep. 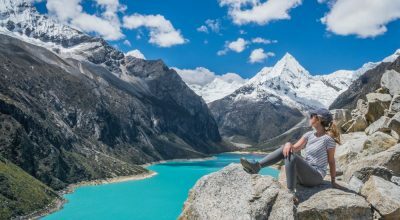 Additional amenities include a vanity nook with a stool and lighted mirror, Apple TV pre-loaded with movies, universal docking station and a safe deposit box. 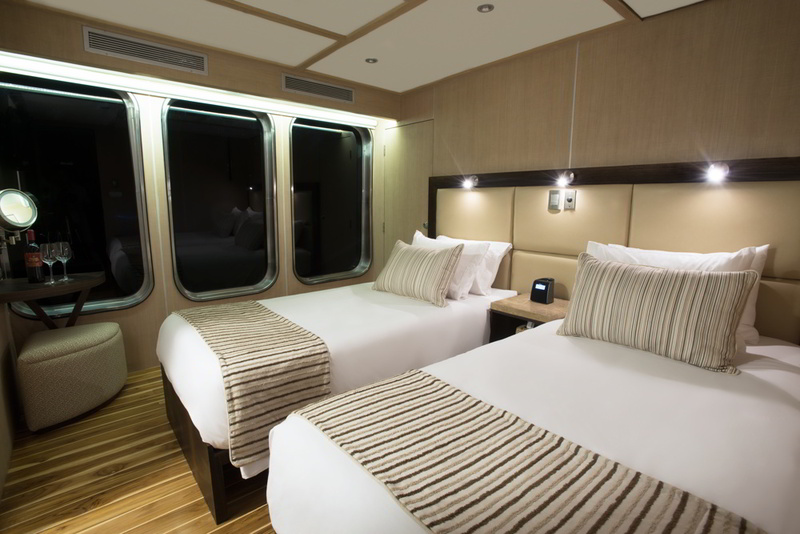 Each cabin also has a personal espresso machine and tea station. Cabins are cleaned twice daily and laundry service is available for an additional charge. 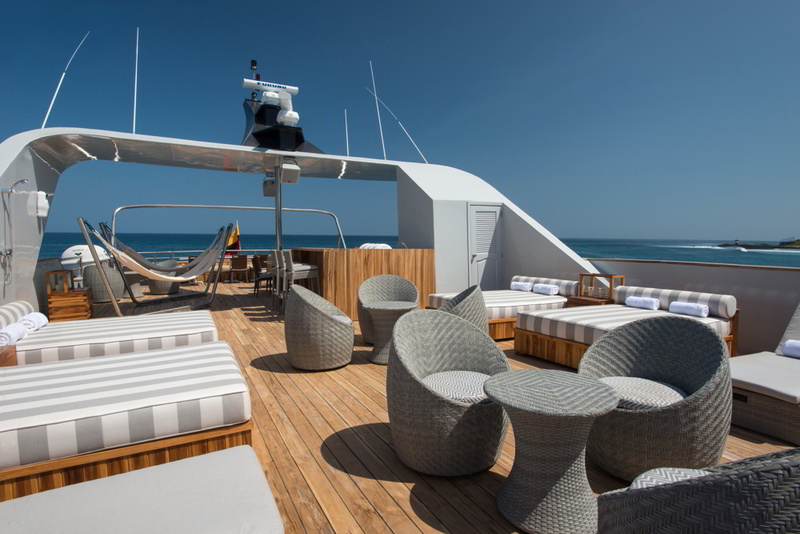 The spacious outdoor sundeck is the ideal place to unwind between island excursions on the Origin Galapagos cruise. It is partially shaded, equipped with day beds, chaises lounges, hammocks, a Jacuzzi and a wet bar. 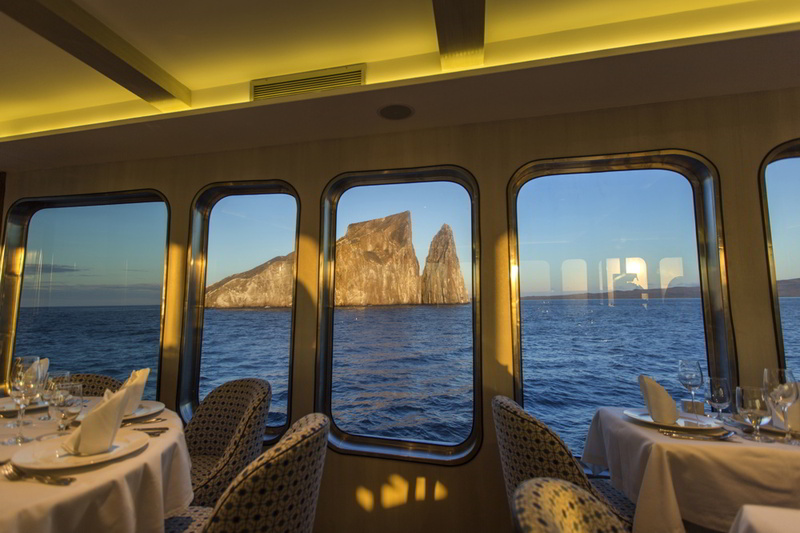 The indoor communal areas of the luxury Galapagos yacht feature a comfortable indoor lounge for evening briefings, lectures or movies, a cozy library stocked with books on the Galapagos and Darwin, an elegant dining room, bar and small boutique. There is also fitness center equipped with a treadmill, elliptical, weights and yoga mats. 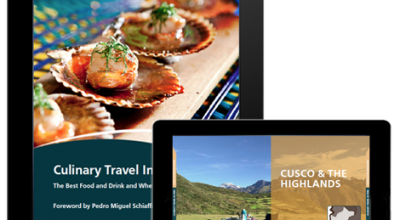 Dine on delicious cuisine creatively prepared by expert chefs using fresh, locally sourced ingredients. The elegant dining room features marble table tops, with configurations from two to ten guests for private or group dining. 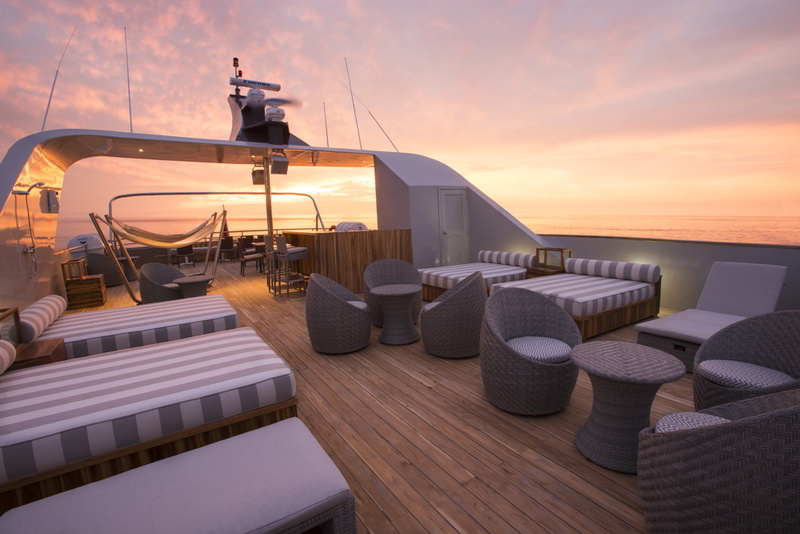 During your cruise you can expet cooking demonstrations and BBQ lunches served al fresco on the spacious sundeck. Enjoy a generous open bar as part of the rate, including wine, local beer and spirits. 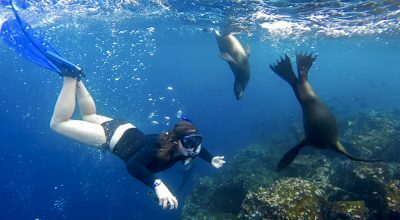 Observe the marine environment with excursions on the boat’s Zodiac, glass-bottom boat, snorkeling, stand up paddle board and kayak.